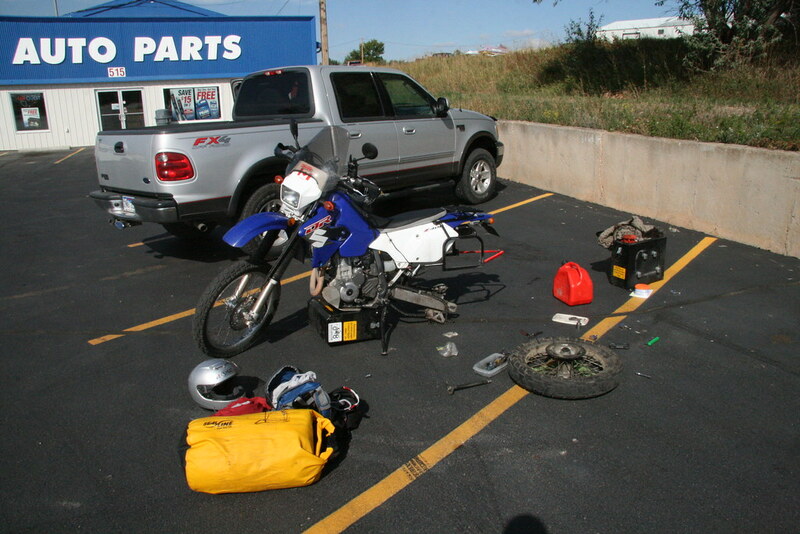 A lot has happened since my last post, which I wrote in an internet cafe in Butte, Montana while waiting to hear about the nature of my DRZ`s mechanical woes. Happily I have long since made it back to Toronto from Montana (although my bike took much longer). I have also have finished medical school, planned a second trip to Africa, and have matched to Calgary for residency (Yay!). The next adventure begins in a matter of days. I will be leaving for Johannesburg, South Africa on May 5, 2010 along with fellow team CanUK members Ted and Jerry. We plan a tour of Southern Africa. Both Jerry and I left our KLRs in the care of Andre in Jo-burg who has been feverishly working on getting them adventure ready for our arrival. Both Jerry and I have decided to install Schnitz Racing 685 cc big bore kits. Both bikes were burning a significant amount of oil by the end of the last trip, so hopefully this will solve that problem. Plus of course there is the added bonus of some extra horsepower, and who wouldn’t want that? The other member of team CanUK, Tom Smith, has beat us all back to adventure having been riding around Southern Africa and South America for nearly 3 months now. Reading his blog and looking at his photos has certainly wet my appetite for my own upccoming trip. Tom’s bike recently rose rom the ashes of a seized engine and has been rechristened “The Phoenix”. Tom took the above photo of the Phoenix in the othewordly Bolivian Altiplano. It certainly brings back memories from when Ted and I crossed Bolivia on our Americas trip in 2007. For the upcoming trip, we plan on doing a circuit through Sub-Saharan Africa that includes South Africa, Namibia, Botswana, Zambia, Zimbabwe, Malawi, Mozambique, Lesotho, and Swaziland. We will be gone for just over 5 weeks, which seems way too short but with residency starting on July 1 there really wasn’t much choice. As it is we will miss our convocation ceremony in June. There is also the small matter of moving from Toronto to Calgary. My plan is to ride my DRZ 400 out to Calgary once I get back from Africa. When I last left off on this blog, I was in Montana awaiting word on what was causing my mechanical problems. It turned out that the impact of the chain popping off and lodging in the front sprocket sheared all the teeth off of 5th gear. There was metal everywhere inside but they flushed it out and I tried to limp back to Toronto with only 4 gears. I ended up ordering a smaller rear sprocket that I installed in a parking lot in Rapid City, South Dakota. This changed the gearing enough that I could ride at highway speed in 4th without revving the crap out of the poor ol’ engine. Installing a rear sprocket in Rapid City, South Dakota. This strategy worked until I was almost home. It was just after midnight and I was on the 401 just outside of Chatham, Ontario, when I lost power and coasted to a stop. The engine would not turn over. I had to get the bike towed into town where I spent the night in a hotel. The next morning, the folks at Bob’s Motorsports broke the bad news: my engine had seized. I guess all that metal floating around in there and revving it in 4th gear for thousands of kilometres was just too much. I had to leave my bike at Bobs and take the train home. Eventually I found a replacement motor on ebay from a 2007 bike. I ended up packing the engine on the train with me to deliver it to Bobs. I went back to ride the bike home about a week later. I am happy to report that the new engine purrs like a kitten and the bike has never run better. I am glad I was able to salvage most of the ride back without 5th gear. Yellowstone park was a highlight of the trip, as was riding through the open range in Wyoming. 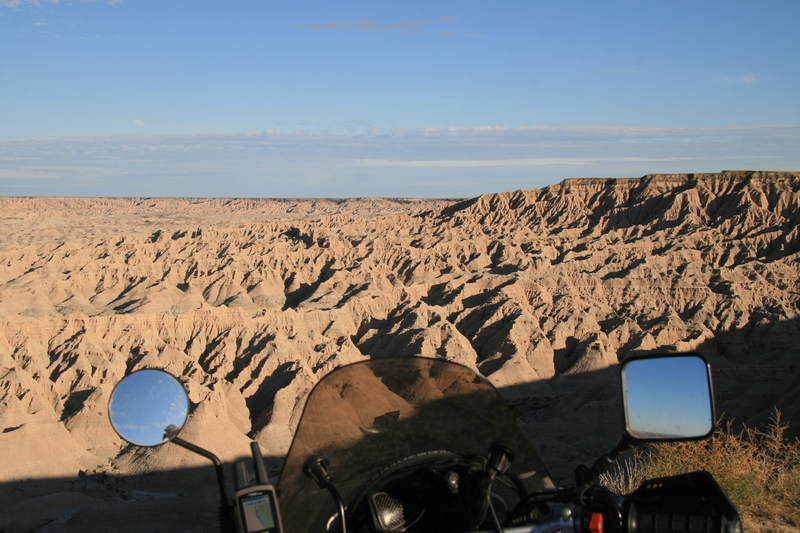 The badlands in South Dakota were also cool. 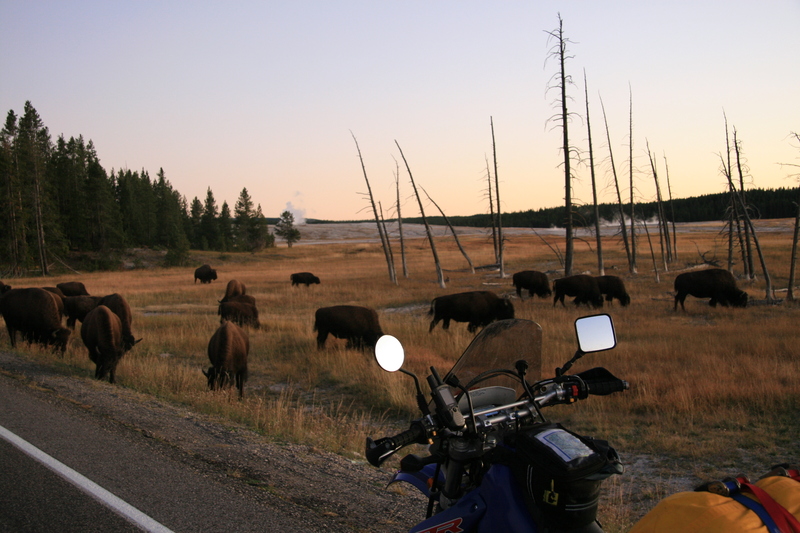 Above: I was treated to a herd of bison crossing the road at sunset, with geysers in the background, at Yellowstone. 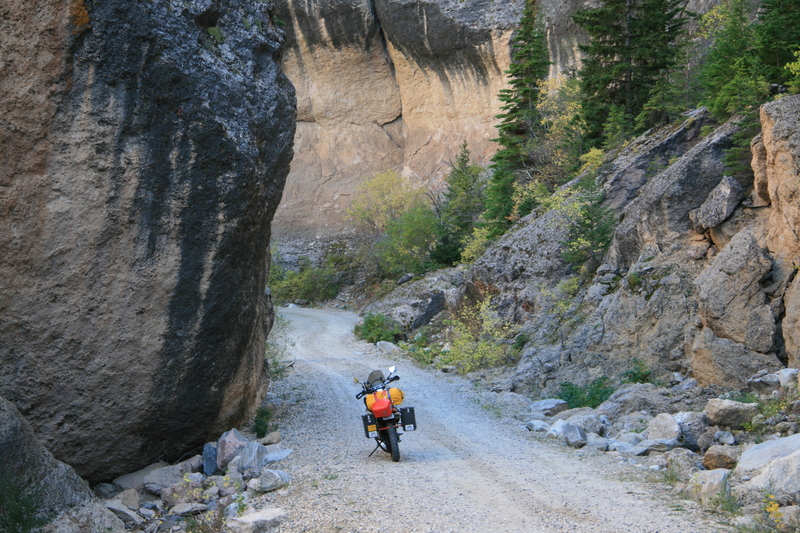 I took a ride down the incredibly scenic, but oddly named, Crazy Woman Canyon Road in the Bighorn mountains in Wyoming. The badlands of South Dakota. I felt like I had ridden onto the set of an old Western. More photos of my jaunt across the USA. PS – After much planning (some of which I was involved with such as the always fun route planning sessions at Cafe Volo), fellow KLR adventurer Adam Tworkowski has recently set off on a solo adventure from here to Argentina. I wish him luck and adventure. Happy trails Adam! You can follow his progress on his blog . The lowest-rate-loans.com are essential for people, which would like to organize their own business. As a fact, that is very easy to receive a credit loan. Some time before, I needed to buy a good car for my firm but I didn’t earn enough cash and could not buy anything. Thank heaven my comrade adviced to try to get the business loans from banks. So, I did so and was satisfied with my secured loan. this blogs is provide of manny auto moters . Wow, the badlands look awesome. One day I will get to the states and check it out..Keep writing, it was a good read. Nice view, I love those photos you have taken. I wish I could go there someday I also love traveling.